©Malcolm Audsley - used with permission. 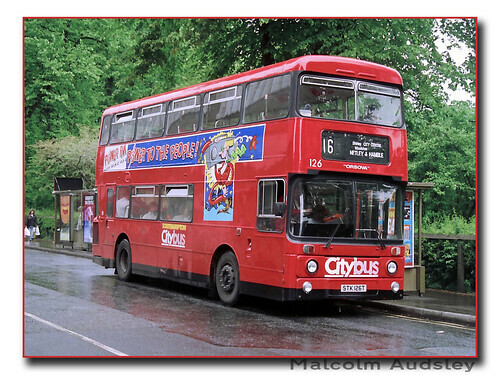 Former Plymouth Citybus Atlantean STK126T is seen in the red and black livery of Southampton Citybus 15 yeas ago, looking very smart. I must admit I dont recall this livery in Southampton though. This was continuing a relationship with Plymouth and Southampton as some years previously there were quite a few Southampton Atlanteans operating in Plymouth, although then they were operated by Western National against Plymouth Citybus!